Paving cleaning removes moss, grass and weeds from your pavers. Paver washing removes the build-up of dirt, allergens growing between the pavers and moss which is potentially slippery, also the weeds which grow between your pavers. As well as spills that stain your pavers. Paving cleaning is the easiest way to keep the paved areas around your home cleaner and safer to walk and entertain on. What are the benefits of pressure cleaning paving? 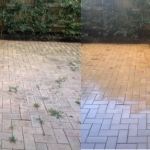 The benefits of pressure cleaning the terracotta, concrete, tile, ceramic, clay, slate, brick or sandstone paving around your home is seeing INSTANT RESULTS. What are the risks, problems or negatives of pressure cleaning paving? With today’s pressure cleaning equipment you can just about pressure wash anything with the right techniques. When it comes to pressure cleaning pavers the risks, problems or negatives are minimal if you know how to use a pressure cleaner correctly. If your pavers are on a bed of sand the key is to not disturb too much of the sand base which can leave the pavers uneven. it’s a good time to refill the joints with sand and to seal the pavers. Sealing the pavers at this time will also help to keep your pavers looking cleaner for longer and minimise the weed growth. Regular paving maintenance will help keep the external appearance of your home in mighty fine shape. Exterior House Cleaning Sydney offers you a free quote for the cost of pressure cleaning the paving around your home. Simply contact Peter on 0410 630 443 or use our Free Quote form.